Fundraising games come in all shapes and sizes. From the sophisticated to the very silly! 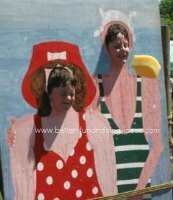 Throwing wet sponges at people is a very easy fundraiser to organise and will prove a popular stall at your fete or fair. Great fundraisers like this don't need much explanation. For really successful and profitable sideshows however you need to get the right person manning the stalls. A larger than life character who can attract people to have a go......... and then have another!. 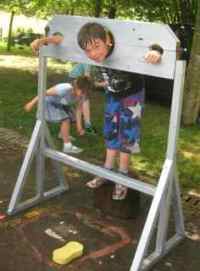 The victims can be held in village stocks like this. Put their face through a board. Or simply be tied to a fence or post. You will need a couple of buckets with 3-5 sponges each. Don't forget to site your pitch somewhere you can easily get fresh water. Filling a dustbin with a hosepipe is a good tip. 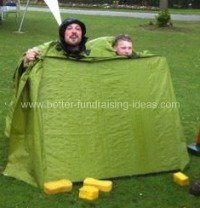 Fundraising games need to be talked up so call your stall something imaginative. Death by a Thousand Sponges! 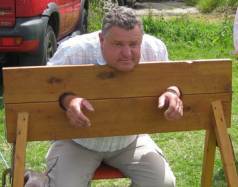 At schools and church fetes putting a well known person in the firing line is guaranteed to attract people. Head teachers, school prefects or local priests and choir-masters make irresistible (and therefore profitable) targets! For cheerleading fundraisers and sports events team members will love to give the coach a good soaking. If your fete is more general another way of running this is to challenge people to sponge their friends or members of their family. What child could resist a chance to get their Dad ? Here is a simple and cheap way to make up a rig for your fete. The plastic sheet has holes cut in it for the victims heads to poke through. The front of the sheet is stapled to a board propped at an angle in front of 2 chairs. Having a board in front looks better and also you get splash-back up into the victims' faces from near misses! Victims simply sit on the chairs and poke their heads through. The rest of the sheet drapes over their backs. This version uses a simple board with cut out faces. The picture on the board can be anything you like. Clowns, Muscle Men, Teachers, Animals are all good. It might be old hat but its fun, its easy to do and it makes money! Raising money does not have to be complicated. Sometimes its the simple fundraising ideas that are the best!